Mexican food was never up to much in England. The 90’s and early noughties saw a series of ‘Mexican’ restaurants serving powdery chicken or beef strips served with tasteless wraps, grated cheddar cheese, sour cream, guacamole with the consistency of pvc glue and a strangely dark green hue, spiceless salsa (dorito chip dip style) and an optional sombrero. I am not going to lie, I enjoyed them (grated cheese on anything was a winner for me). In my youth, I was bribed to eat many a green vegetable with a cheese sauce coating. Fast forward fifteen years and you can find heritage corn tortillas with braised meats, a variety of salsas and condiments. You can even get a ‘tofish’ taco in the pub round the corner to me (not the toe of a fish as you might assume, but tofu wrapped in seaweed, battered and deep fried). There is a Mexican online grocer. You can buy chipotle and ancho chillies in M and S. Things have changed. Still it is a shadow of the food life of Mexico, which was a real revelation when I visited a few years ago. The vast and jumbled food markets seemed to go on for miles. The cafes, stalls, stands and every street corner were serving delicious, flavourful and inexpensive food. There was no need to step inside a restaurant. I ate octopus tostadas and sea bass ceviche in Coyoacan market, tamales dipped in rich hot chocolate in La Merced on a 4am insomnia driven chilli purchasing spree. I ate tacos stuffed with chapulinas in Oaxaca city for breakfast (crunchy, salted crickets) carnes asada at Mercado 20 de Noivembre (barbecued meats and vegetables served with pickles, many salsas, guacamole and tortillas freshly made and lightly charred). Carnitas, tacos el pastor and chorizo tacos were eaten on every and any corner when hunger struck. I ate empanadas with Amarillo mole (sounds so much better than the translation of yellow sauce) trying to guess what was in it. There are about as many ingredients in a mole as in an ottolenghi recipe. Needless to say I didn’t get very far. My favourite food memories of Mexico are of the breakfasts in Chacahua National Park on the Oaxaca coast, camping with friends and idling away the hours. Each camping area had a kind of cafe, which prepared your meals and chalked them up. At the end of your time there, they totalled it all up and you paid before you left. The food was simple, delicious, slow to arrive (sometimes it didn’t and then two would). There were chilaquiles, enfrijoladas, huevos rancheros, tostadas, tortas, huevos revueltos. 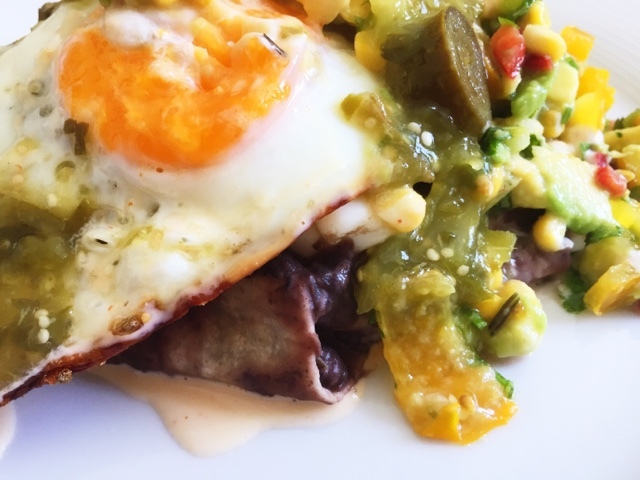 Here is my take on enfrijoladas; a simple breakfast dish of tortillas layered with black beans, optional eggs, salsa verde or salsa rojo and a chunky guacamole. As the likelihood of getting fresh tomatillos is rare unless you have done as I have and purchased in bulk from riverford, try the recipes replacing the tomatillos with underripe tomatoes. Or buy loads of tomatillos now and then pickle them. Add the coconut oil to the pan, gently fry the garlic and onion until soft and translucent , add the vinegar, oregano, cumin and combine, followed by the black beans. Add the chipotle chilli, the water and the salt. Bring to the boil and then reduce to a simmer. Simmer for at least 20 minutes. You may need to add more liquid. I like to simmer the beans until there is barely any liquid left and then when it becomes dry add a bit of water. I do this a few times and it results in very creamy beans. Add the chocolate a few minutes before the beans have finished. Remove the chipotle and discard. Leave the beans as they are with some texture. If you are doing this, make sure the beans have enough liquid in them (the consistency of a thick soup) so that you will be able to dip the tortillas in them. Blend the beans in a processor / with a stick blender. You could have them extremely smooth or part smooth / part texture. For the latter, blend half of the beans and then mix them with the unblended beans. You can put the beans aside and reheat when required. Chop the avocado to a medium dice, mix with a spoon so that it is part creamy, with chunks. Strip the corn fresh of the hob (if your corn is not very fresh, boil for a few minutes, leave to cool and then strip from the cob). Finely chop the spring onion and red chilli. Combine everything and add the red wine vinegar and lime. Just before serving chop the coriander and add to the guacamole with the salt and optional an extra squeeze of lime. If you do not have a tortilla press (I have seen them on the UK Mexican grocery online shop Mexgrocer I would probably advise buying ready made corn tortillas. I have seen them in marks and spencers and sainsburys. The problem with making a tortilla without a press is that it is basically really difficult / almost impossible. What should take 1 minute, will take ages, your tortillas will break and they will not be thin. Add the masa harina and salt to a bowl. Add the water, combining everything with your hand until the dough comes together. Roll 12 small balls smoothly. Place a piece of cling film in your press and a corn ball in the middle of the press. Place another piece of clingfilm on top of the ball. Press down in one motion. Carefully open and peel the tortilla off the clingfilm and set aside. I would suggest not layering the pressed tortillas up they stick together. I usually press 3 and then alternate that with cooking them / pressing the next batch. Keep them in a clean tea towel until ready to use. The ingredients for this are more accessible. Roast the tomatoes whole in the oven for 20 minutes. Fry the onion, garlic and ancho chilli’s with the oregano, cumin and salt until softened. Add everything to a food processor with the lime juice (a bit of water may be required) and process until smooth. Run the mixture through a sieve so that you have a smooth, salsa rojo. Make sure the beans are warm, dip the tortilla fully in the beans, or alternatively use the back of a spoon and spoon the mixture on to both sides of the tortilla and smooth. Either serve rolled up with the toppings added to the top. Shredded / crumbled queso fresca – as we do not have Oaxaca cheese readily available in the UK, look for a white stringy cheese; halloumi, Turkish kasr, a mild feta would all work pretty well.